Distribution: Woodland, open forest and heath in western Victoria and south east South Australia. aquifolium...a reference to the resemblance of the leaves to the exotic holly, Ilex aquifolium. Grevillea aquifolium is typical of the "toothbrush"-flowered grevilleas where the individual flowers are arranged in a terminal one-sided raceme. Serra Road form - usually prostrate to about 2 metres across. Carpenter Rocks form - prostrate or to about 0.5 metres with leaves less toothed leaves than other forms. The foliage is usually noticeably toothed with sharp points at the ends of the nodes although some forms may be almost entire with few lobes. Leaves range from 20 ro over 100 mm long by 10 - 35 mm wide. The flowers occur in clusters 25 - 50 mm long from the ends of the branches and are usually red but may also be greenish yellow. Flowering occurs in late winter and spring. Holly grevillea is well known in cultivation but is best suited to climates with a dry summer. It seems to resent humidity and can be unreliable in coastal areas of New South Wales and Queensland. It prefers well drained soils in a sunny or semi-shaded situation. It withstands extended dry periods once established and is tolerant of at least moderate frosts. 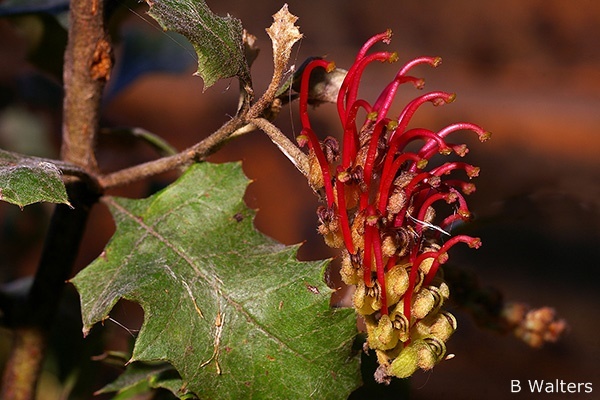 In common with most grevilleas, honey eating birds are attracted to the flowers. Propagation is best from cuttings of firm, current seasons growth. These usually strike readily but misting should be minimised with hairy-foliaged forms.